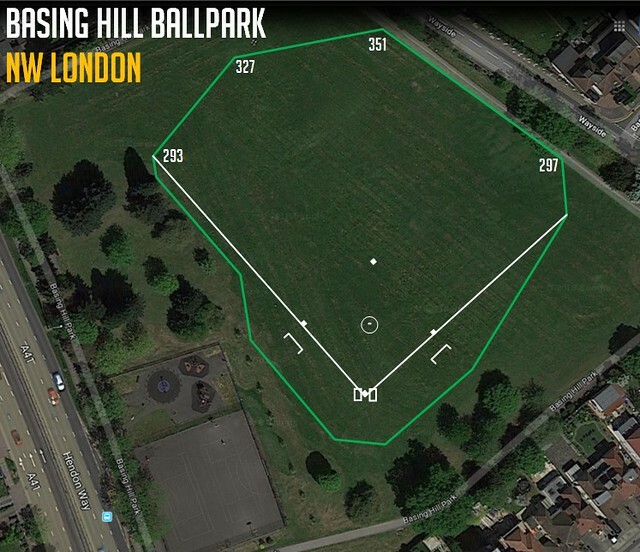 Basing Hill Ballpark was opened in 2019 as part of the club’s expansion in North West London, coinciding with the arrival of the New York Yankees and the Boston Red Sox for the MLB London Series in 2019. Head South on M1 until you reach the end. Take the slip road towards A41. Continue for 300 yards. use the 2nd from left lane to take the A41 slip road to Central London. At the roundabout take the third exit towards Central London/Kilburn/Cricklewood. After 800m turn left into Wayside and continue until you see Basing Hill Ballpark on your right. Exit A406 North Circular Road and take Hendon Way/A41 to Central London. After 800m turn left into Wayside and continue until you see Basing Hill Ballpark on your right. As you drive North on Hendon Way/A41 turn right at the lights onto The Vale. After 200m turn left into Wayside and continue until you see Basing Hill Ballpark on your left. The station is 11 minutes walk from Basing Hill Ballpark. The station is 16 minutes walk from Basing Hill Ballpark. The station is 22 minutes walk from Basing Hill Ballpark. Buses 102, 113, 226 and N113 stop at The Vale Cricklewood (Stop W) which is right next to the Ballpark and Buses 102 and 226 stop at Dunstan Road which is 1 minute walk from the Ballpark. Parking spaces are available on the streets on the North East side of Basing Hill Ballpark. Parking is free in the marked bays any time other than 11am to 12pm Monday to Friday. No parking restrictions in these marked bays on weekends (check signs next to the bay which you are parking at to make sure).